We hear on a daily basis about Search Marketing, Search Engine Marketing (SEM) and Search Engine Optimization(SEO). But what does it really mean? Is Search Marketing the same with Search Engine Marketing? – the answer is no. Search Marketing is the process of gaining website traffic both organic (SEO) and paid(SEM) advertising. SEO is the process of improving your website and content so that it’s visible to search engines. The process is organic and requires a lot of patience. SEM is paid advertising with the help of search engines. Advertisers pay and bid on specific keywords to be shown when searched for. Since both SEM and SEO are two broad and confusing topics, in this article I am going to speak about SEM, what is it, how to use it and what practices are best in order to maximize your event’s exposure. When somebody is searching for an event the results displayed at the top of the search engine’s page represent the search ads. And obviously that’s the place you want your ad to be displayed in order to make your future attendees find you fast and easy. The most popular among search ads are Google Search Network which handles more than 40,000 search queries every second and a total of more than 1.2 trillion web searches every single year. Google Search Network as explained above, are the ads which help you find new customers and if used right your ads will be displayed within the top searches. One of the major misconceptions is that whomever has the largest advertising budget wins – False! On top of the money, what Google stands for is delivering the most appropriate content to it’s users. For this to be possible all ads have to pass through a process which is know as ad auction and only the ads with the highest Ad Rank will be placed in the top searches. Yes, a larger advertising budget can help you, especially when bidding for competitive keywords, but another important factor which can help you spend less money is the Quality Score. Maximum Bid is the maximum amount of money you you are willing to pay for a click. The one characteristic which “weights” the most from the above mentioned is the click-through rate (CTR). It tells Google how many people saw your ad and actually clicked on it. This allows Google to understand that your ad is relevant and helpful and will increase your quality rank through a high CTR. -use WordStream’s Free Keyword Tool, which provides a range of valuable information, such as search volume for each individual keyword in Google and its general competitiveness. -to find out how well your account is doing, try WordStream’s free AdWords Performance Grader. Group of keywords – create group of keywords and market them separately and on different occasions. It is easier to monitor which ones are successful or not. It is easier to remove the ones which don’t generate any ROI and be cost effective. Niche keywords and long tail keywords rather than general ones since the consumers who are searching an event with the intention of attending will be more specific in their searches and keyword selection rather than searching for general keywords. Keep pace with the competition – It is important to be updated with what your competitors are doing too, what keywords or promotions are using. Try being creative and keep up the pace with them. Bidding strategy – you should not be focused on the general keywords and how much your maximum bid can be. You should permanently monitor the campaigns, check which keywords are converting or not and practice the AB testing within keywords and campaigns. Once a new user lands on a page, a profile is going to be created and with which it’s whole journey is going to be monitored. From that moment every marketing link clicked on, every page viewed, and every ticket bought, is captured in the profile where it can be analyzed and understood. 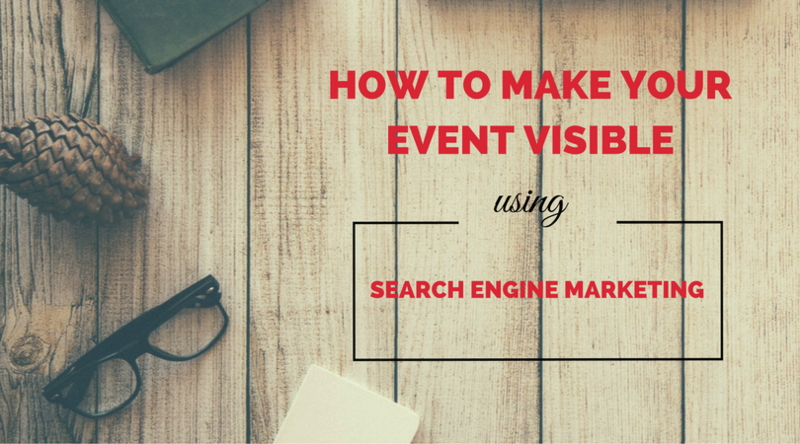 SEM can be a significant tool for your event. It is the tool that helps your attendees find you and in order to do that successfully you need to make sure it is used adequately. Not only Search Engine Marketing but the whole process has to be used in the right way. SEO, SEM and of course the paid ads. CTR% – Click through Rate (as a percentage) – a metric that measures the number of clicks advertisers receive on their ads per number of impressions.